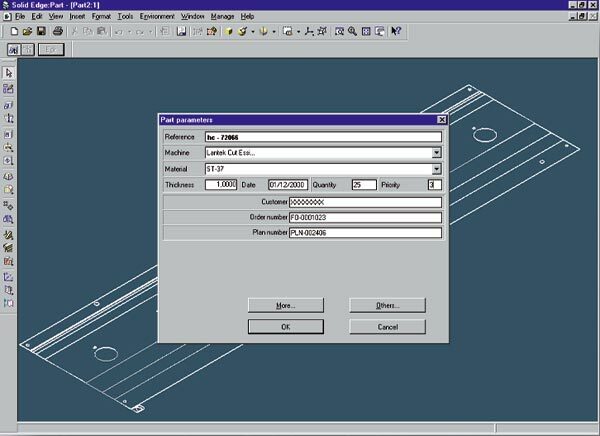 Zoom Lantek Flex3d SE is a software program which enables 3D sheet metal designs to be automatically unfolded and saved in the Lantek Expert database for subsequent use with Lantek Expert Cut and/or Punch. Totally integrated with Solid Edge� from its V7 version onwards, it is the ideal solution for creating and automatically unfolding parts in three dimensions. Lantek Flex3d SE is a powerful intuitive tool that eliminates the need for the generation of unnecessary files or intermediate file formats. It provides Solid Edge� users with a direct route into sheet metal manufacture with Lantek Expert Cut and Expert Punch software. Designed for both subcontracting companies and companies with their own products, Lantek Flex3d SE forms part of a design environment, Solid Edge�, which encourages productivity, creativity and design.